This compilation contains 11 of the 14 Capitol Punishment tracks. There are no new tracks to lure fans (such as me) who own every Megdeth album already. Mere casual fans of the band likely bought Capitol Punishment in 2000, meaning that they won’t need this album (even though it does have more tracks). For the casual fans, I think a two disc set may have lured them into buying this album, even if they already owned Capitol Punishment. Die hard fans that own every Megadeth album will have no use at all for this release at all. Having said that, I do like the idea of allowing fans to decide the track listing for a greatest hits album. If someone out there doesn’t like the band enough to own all studio albums, but would like to have their best moments on one disc, what better way than to have the fan’s pick of songs on that disc instead of a label executive? Still, releasing a greatest hits package containing eleven tracks that overlap a greatest hits package released just five years ago makes no sense to me. Here at metalreviews.com, we make an honest effort to review all material that is submitted to us for review. Often, we have plenty of compliments about the album at hand. Even though I am a big ‘Deth fan, this album reeks of corporate greed to me. 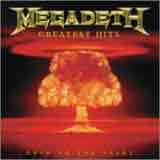 Since Megadeth won’t be releasing a new studio album under Captiol anytime soon, it appears to me that the label is using ANOTHER greatest hits release as a cash grab. I could be totally wrong, but I am left scratching my head trying to figure out the point of the release. If you’re a passing fan of Megadeth and don’t own Capitol Punishment, this is without doubt a nice pickup for you. However, I would assume that most of you reading this review either own all of Megdeth’s studio album, or at least own Capitol Punishment. For those of you, this is an utterly pointless release. Without any new or previously unreleased material to be found on this CD, I see a very small audience for this release.